In a fantasy world I'm building I wanted a group of tundra dwellers to live within a large city that is in reality the frozen remains of a pod of this world's equivalent of sperm whales. Is there any logical way to explain how a whale pod became trapped in ice? Preferably with the ice somehow being above the surface and looking like a small mountain. 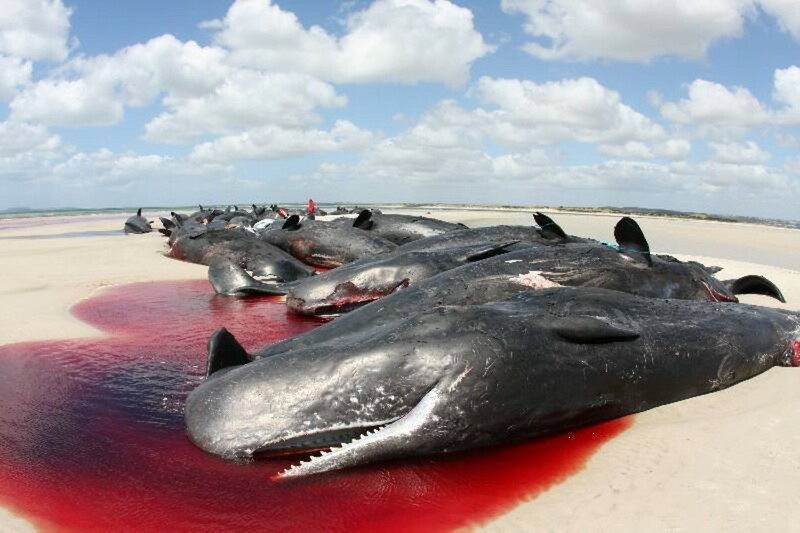 1: Sperm whales can get beached in large numbers. 2: Sperm whales can apparently get beached on icebergs. Dead, Decaying Whale Poses Puzzle: How Did It Land On Top Of An Iceberg? May 16, 1985|United Press International NUUK, GREENLAND — A dead whale frozen in an iceberg 13 feet above the surface of the frigid waters off south Greenland is mystifying scientists and curious residents of a tiny Greenland settlement. Close inspection reveals the whale may have been the victim of a hunter`s harpoon. In its neck is a cylindrical hole 15 inches in diameter and three feet. They believe the whale, weakened or dead, could have drifted over the submerged portion of an iceberg and become an involuntary hitchhiker when the iceberg separated and a submerged portion rose under the whale. 3: Big icebergs can get beached too. 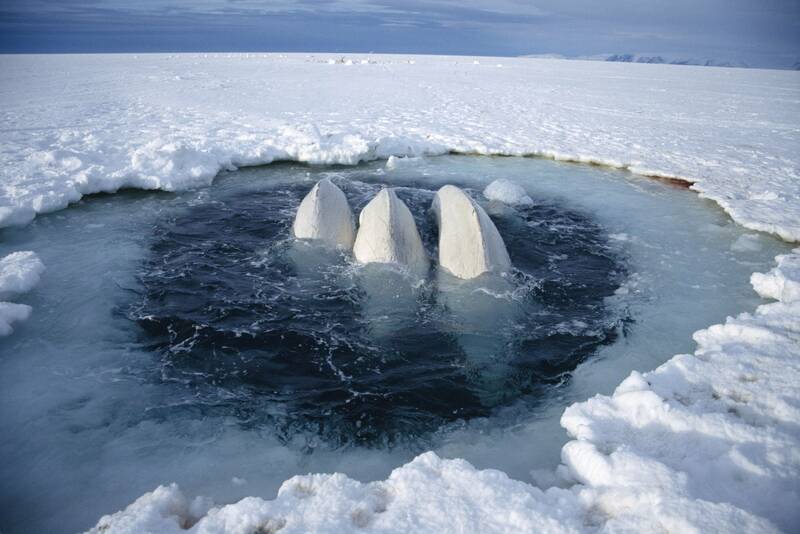 1: Sperm whale herd beaches itself on floating iceberg. 2: Iceberg pivots in the water as it melts, lifting beached whales to new topmost portion (as with above pasted story). 3: Iceberg itself is beached on land and there it sits. Maybe it gets wedged in a fork in an existing glacier. 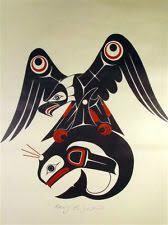 4: Whales atop iceberg rot and are eaten by seabirds / foxes etc. 5: Snow and ice accumulate atop iceberg which is incorporated into glacier. 6: Later, whale skeletons are found entombed in the ice. 7: People move in and make cozy cottages. 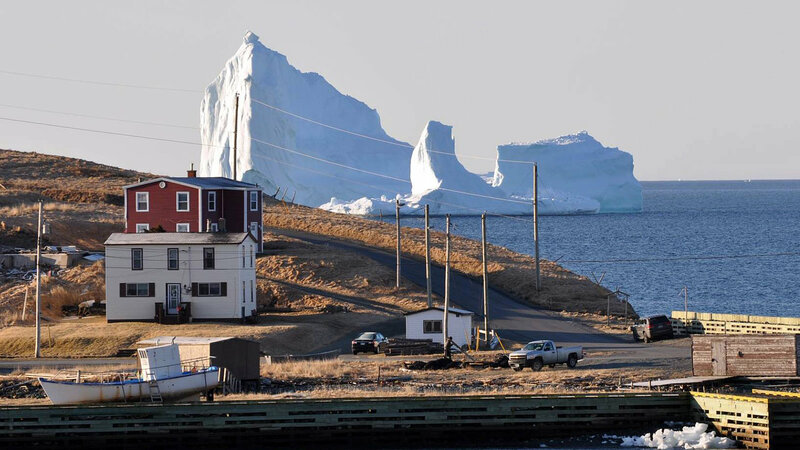 This scenario would mean the dwelling are right on the coast, where the iceberg came to rest. Another possibility is that the whales were moved one at a time to the high spot where your tundra dwellers found them. A thunderbird would do that. As this Skeptics answer shows, fish getting frozen in ice is entirely possible. The whales entered a near-freezing bay with a small inlet. A shift in the wind caused the inlet to freeze over, trapping the whales in the bay. 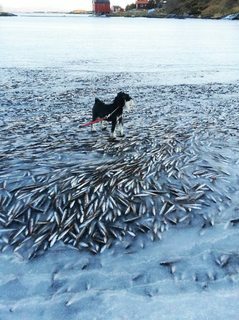 As the winter grew colder, the bay froze as well and trapped the whales in the ice. As spring approached, the inlet thawed and the whale-filled iceberg drifted out to sea. It eventually beached itself in the tundra where your dwellers could find to create their new frozen home. Whales are mammals that must break the water surface to breath. Whales often die with their heads stuck in an ice hole. 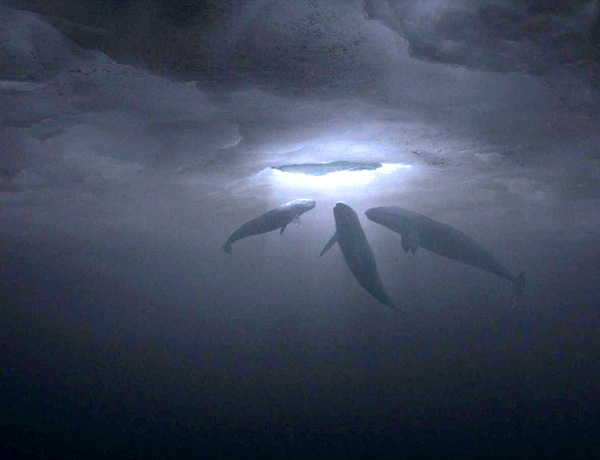 Whales can find themselves swimming underneath a frozen sea. The diameter of the ice shelf can be greater than they can hold their breath. As the sea surface continues to freeze over they search for air holes and become stationary. Holding their heads through the holes to breath unable to swim to another location (there are no more holes). They die when the hole freezes and traps their head into position. Their bodies become part of the ice shelf with their heads sticking out. 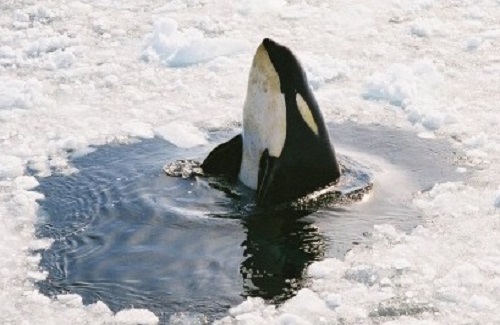 Other whales die under the water and become frozen into the ice. I'm sure a larger sperm whale could die in the same manner. Operation Breakthrough was an international effort to free three gray whales from pack ice in the Beaufort Sea near Point Barrow in the U.S. state of Alaska in 1988. Would an ice bullet work? Would it be possible to keep a whale alive whilst harvesting its fat?